As you start picking venues for that summer beach holiday that you take every year, you find yourself looking for something really special without actually having a fortune doing so. Imagine lying down on the beach, under the beautiful Sun, knowing that you will not have to mortgage your home for going on this little trip. So where do you go when it’s the three S-package (Sun, Sand and Sea) you want? Portugal has some of the most fantastic untouched beaches on the planet and, if you are looking for something that can fit your budget, look no further. While there are plenty of high-end beach resorts and fantastic places to blow your life savings away, there are also a lot of wallet-friendly places that you can enjoy with your entire family. Here’s a look at some of those places where you can find a lot more for your money. The thing about Algarve is that it is not only one of the best and most beautiful beach destinations in Europe, it is very affordable too. There are plenty of beach resorts to cater to over 20 beaches, some of which come with a Blue Flag rating too. However, you don’t need to worry about budgets as long as you stay away from the tourist-traps. 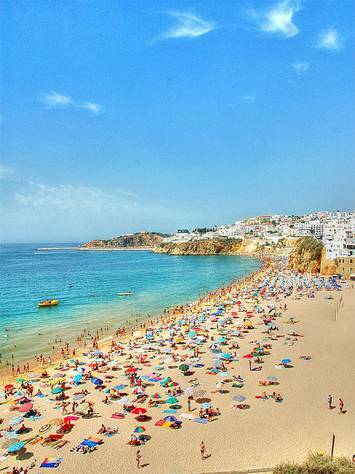 Albufeira is one of the most popular beaches in Algarve and you can instantly tell that by the crowds you see there. If you are willing to auction off your child, then you can think of living in one of those beach resorts that share a border with this fantastic beach. Or you could just head on towards Coehlo or Soa Rafael and Vigia. Coelho is all about spending a quiet time with your family while you may find Soa Rafael and Vigia to be a lot more interesting, with their natural rock formations and all. However, you won’t know what tranquillity means until you land at the fantastic Cacela Velha beach at the Eastern tip of Algarve. The name of the beach comes from the name of the village that sits atop a hill, looking out to barrier islands for about 60 miles. The beach is completely unspoilt and the only way to get down to it is by walking down a tiny path alongside a 12th century fort. If you get there when low tide comes in, you’re in luck because getting to those islands is just a small wade through the waters away. Stay there until the tide drops again and you would have enjoyed your beach holiday with a twist like never before. When you get to Praia Cabo Mondego, near Buarcos, you are not only greeted by Sun, sand and sea, but also by mountains. The pine forests run all the way down to the beach and getting down to it will require you to park your car on one of the many viewing-stops on the Serra da Boa Viagem mountain range. You walk down a rugged path towards the Cabo Mondego lighthouse and continue onwards to the beautiful sandy cove and rocky shores of this breathtaking beach. Remember, there’s a climb back up that you need to make too, so don’t get too lazy out there. When people go down to the beach during their Portugal holidays, they find themselves stuck with popular destinations that require a small fortune just to stay afloat. If you are looking for Sun, sand and the sea, then you will find yourself nicely covered in all three when you head down to these fantastic locations. Within any budget, you can have as much fun in terms of water-sports and lazing around as you would have anywhere around the world. Do you need more reasons to pick Portugal as your budget holiday destination? Samantha fell in love with Portugal the first time she landed on its shores. She has, over the last four years, spent her summers looking for new beaches in Portugal and with the recession falling in the middle, her Portugal holidays have had to deal with lower budgets more than anything else. Her love for this beautiful country continues and Samantha plans to explore every last inch of this country where she plans to settle down for life.